Audi has given us a preview of the forthcoming Q6 at the Frankfurt Motor Show. 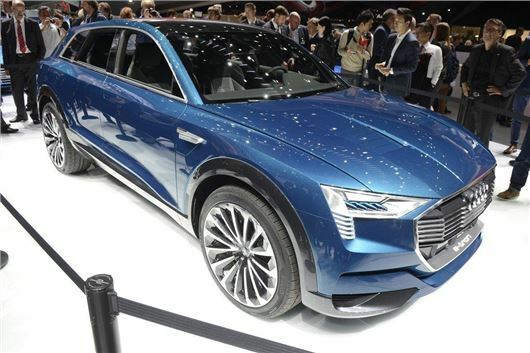 The e-tron Quattro concept will eventually become the Q6 which will arrive in showrooms in 2018. The Q6 e-tron Quattro will use a four-wheel drive system, with one electric motor at the front axle and another two at the rear. According to Audi the three motor layout will create an ‘electrified quattro’, making the e-tron quattro concept both 'highly efficient and responsive'. It also has a range of up to 310 miles. Power comes from a lithium-ion battery, positioned between the axles and below the passenger compartment, to lower the Q6's centre of gravity. There are no details about charging times or if the battery will be included in the list price of the car or leased as part of a monthly fee. As the name implies, the Q6 will sit between the Q5 and Q7 in the Audi range and will combine an SUV body with a coupe-like cabin. The Q6 will have space for four adults and use organic light emitting diode (OLED) technology to illuminate the cabin and instrument binnacle. Unlike LEDs, that use glass sheets, OLEDS use a plastic film that can be folded, twisted or bent like paper to fit. There are no details on pricing as yet, but the Q6 is expected be offered with a range of power outputs, including a performance focused 500PS version.